When Jerry Brown was California’s governor in the 1970s, he frequently cited E.F. Schumacher’s influential book Small Is Beautiful while promising an “era of limits.” Brown hasn’t resurrected that slogan since becoming governor again two years ago, but he might as well have: he has not been a particularly conspicuous figure while serving as chief executive of the country’s largest state. Yet his governorship was reinvigorated over the past couple weeks by a late-blooming effort in favor of Proposition 30, a revenue-raising ballot initiative. This effort culminated in a stunning victory on Election Day. Now, with the political winds at his back, the only thing in Brown’s world to which “small is beautiful” might apply is one trusted surrogate who worked extra-hard for the Yes on 30 campaign: his dog. As innumerable photographs appearing on his Twitter account and Facebook page testify, Sutter Brown, a nine-year-old Pembroke Welsh corgi, is rather small, if disproportionately elongated (corgis are like larger, more furry, and more dignified dachsunds; the Queen has corgis). Sutter is also exceedingly adorable and Internet-friendly, making him a more appropriate prop than you might initially think. After Election Day, Brown himself credited Sutter with lending a “human quality” (a slightly disturbing thing for a human to borrow from a dog). But he also gave his aging, awkward, aloof owner something that was even more valuable Tuesday: credibility with the very young people he said Prop 30 would help, and whom he needed for Prop 30 to succeed. Prop 30, on which 54 percent of California voters voted “yes,” increases taxes on income over $250,000 for seven years and raises sales taxes slightly for four years, upping state revenue $6 billion annually into 2019. That money will go to public primary schools (which won’t face slashed budgets anymore), community colleges (which won’t have to cut thousands of courses), state colleges, and even the University of California system (which had faced a near-certain tuition increase). Critics charge that Prop 30 lacks a mechanism for ensuring that the new funds are spent on education. With only two weeks to go and “likely voter” support dropping below 50 percent, Brown suddenly began to campaign tirelessly on behalf of Yes on 30. Meanwhile, Sutter went on a “30 for 30” tour of 30 Democratic field offices up and down the state, chronicling his journey on his Twitter feed. Ever since Brown’s wife, Anne Gust Brown, named Sutter California’s First Dog, he has been a source of little other than amusement for the Sacramento press corps and other observers (although, as the Sacramento Bee reported, during that first press conference, Brown’s office announced a statewide hiring freeze—which received virtually no press attention). Now, he was getting into the mix. When I first reached a Yes on 30 spokesperson last week to inquire about Sutter’s involvement, he replied, “It was Sutter’s idea. He’s a big supporter of public education.” When I pressed further, the spokesperson added: “What else is there to say? It may alienate the cat vote, but people love him.” In fact, the Los Angeles Times reported, Sutter’s tour was thought up by the on-leave California director of the Humane Society, which supported Prop 30. And it was certainly official: Sutter even penned a note on Yes on 30 letterhead. It would be a ... stretch to suggest that Sutter was responsible for Prop 30’s passage. But Sutter actually did fit uncannily into the overall strategy. As McCuan explained it, with the polls dropping in October, Brown needed to turn out new voters—in order to boost that “likely voter” figure—and young voters, who are the most obvious beneficiaries of an education revenue-booster (Brown spent much of his campaign time on campuses). Given those parameters, who better than Sutter? He is cute as hell—“this dog has more personality than the governor,” McCuan told me. He is social media-savvy: “He’s a corgi, so he has small paws, so he can work the BlackBerry pretty well,” the Yes on 30 spokesperson said. And the corgi is, as CNN has reported and millions have noted, the ultimate Internet dog breed: humorously named, humorously shaped, and infinitely a-meme-able. 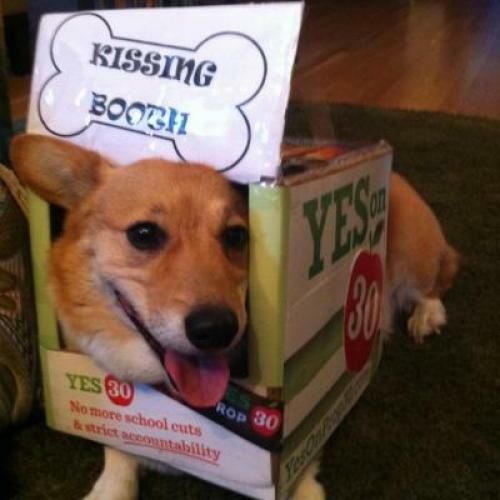 (Check out BuzzFeed’s corgi tag.) So Sutter gave an interview. And phoned supporters. And hung out with volunteers. And visited the ocean. And received a key to the city of Chico. And took an occasional nap. Okay, I’ll stop. After this one. The point is, he was designed to bring new folks into the process, with an emphasis on the type likely to find corgi Internet pictures appealing—also known as young people. Sutter’s Twitter feed has fewer than 5,000 followers, but he received outsize media attention, both in-state (including the Los Angeles Times) and nationally (including the New York Times). And something rocked the youth vote: according to an exit poll, a whopping 28 percent of the California electorate fell into the 18-29 demographic (in 2008, it was 20 percent); these young voters reportedly supported Prop 30 by a two-to-one margin. As Barack Obama said in his victory speech, one dog is enough for his family. But politicians around the country dependent on social media and the youth vote might want to follow the Sutter model. We have known at least since the days of FDR and Fala that pets can provide a “human quality.” And anyway, when you are trying to grab the attention of new, young voters, you can do worse than posting cute animal pictures on the Internet.